During our baseline assessment Female Community Health Volunteers and the District Medical Officer both highlighted genital prolapse as an issue and asked us to help. Uterine Prolapse can be extremely debilitating socially and medically for village women. It remains a largely hidden problem although it affects all age groups, from young women to old. 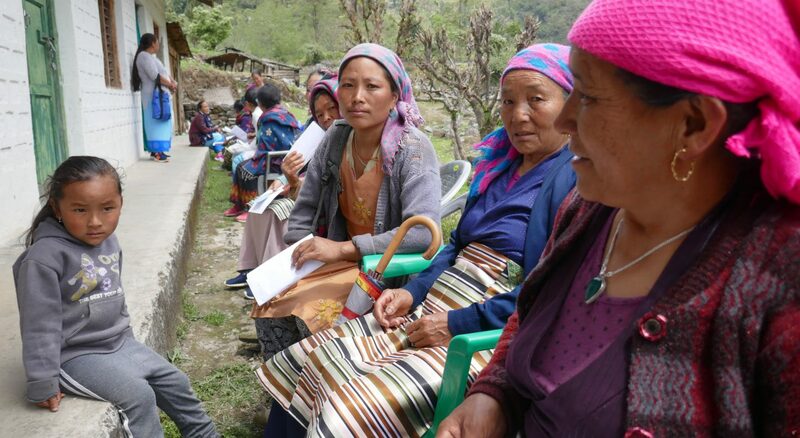 We organised a two-day pilot Uterine Prolapse health camp in Yamphudin during April and the attendance was encouraging with 65 patients on the first day! 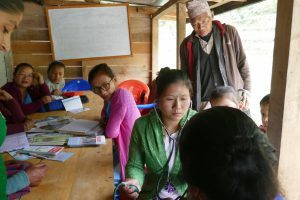 Tika and Mina, the newly trained Auxiliary Nurse Midwife and Community Medical Assistant, and a small team of doctors and nurses have assessed the women, treating those they could and referring others to the Zonal Hospital in Biratnagar. MIDSON and the Professor of Public Health at the Institute of Medicine also stressed the importance of our working on this topic. Such work has become more feasible by the Government stating that they would pay for all genital prolapse operations at designated hospitals. As part of our overall Health Programme, we are working to improve villagers’ health literacy and the maternity services, both of which will help prevent cases in the future. However, there is a cohort of women suffering now, so this camp has provided some immediate relief and education. We’re hoping that more of this type of work can be done once the Yamphudin Health Centre is finished.